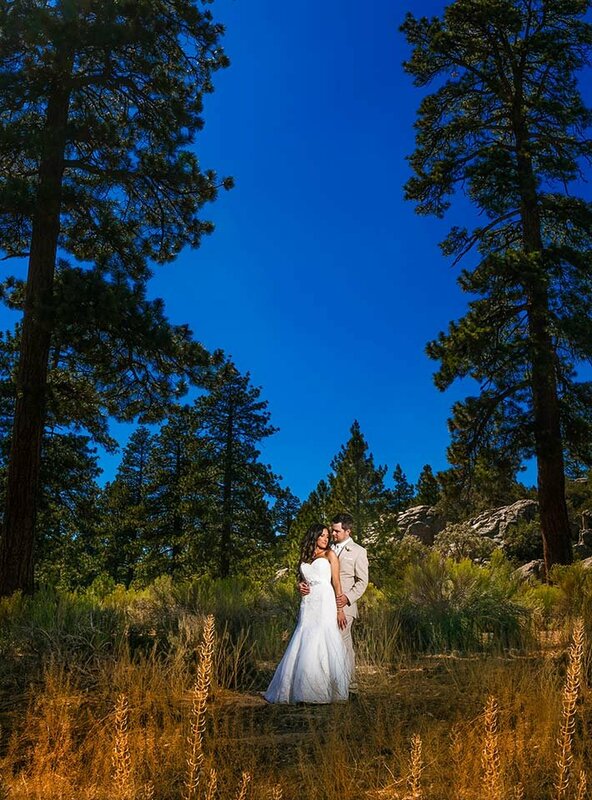 Wedding Seasons at Big Bear Lake...Each season tells a different wedding story. A Gold Mountain Manor Spring Wedding is focused on the senses and brings the fragrance of mountain blooms, vibrant hues, the songs of the birds and the experience of dancing barefoot on the Manor’s luxurious lawn. Spring creates a pastel landscape of flowering white cherry, vibrant red apple and pink plum trees while dozens of fragrant purple lilacs drape the acre of lush grounds and stone pathways. The red roses are peaking all around our bed and breakfast in Big Bear, woven along the wood fence to give a romantic feel. All of which are surrounded by Ponderosa and Vanilla-scented Jeffrey Pines as red tulips and yellow daffodils playfully dance in the wind. 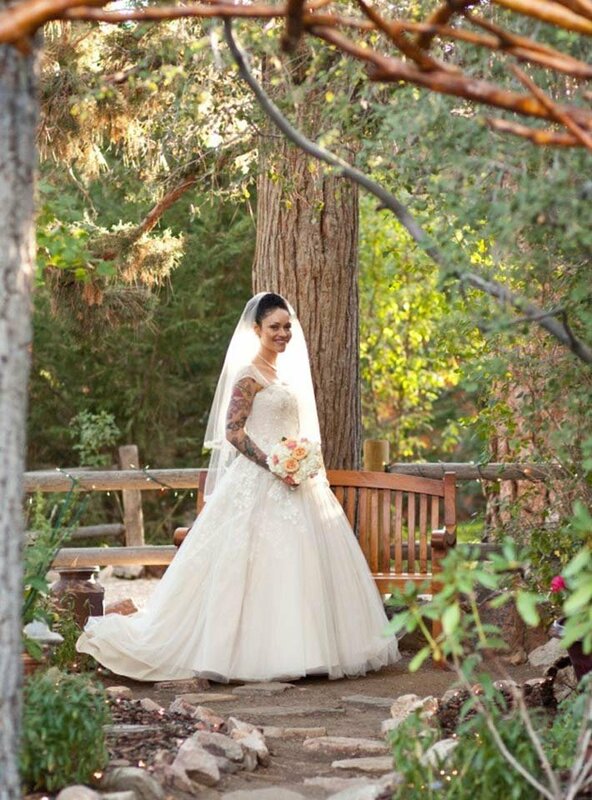 As Big Bear welcomes Spring, during your wedding you may hear the sounds of baby birds in their nests and will see the frolic of squirrels and the fluttering of butterflies. Cool crisp mornings melt into warm sunny afternoons and are perfect for an afternoon mountain garden wedding, while evening weddings transform into a magical twilight of hanging candles and white twinkle and swag lights as you dance under the stars. A Gold Mountain Manor Summer Wedding promotes long days and warm nights allowing for an endless day into an evening wedding. The garden flourishes with bold red, yellow and orange Roses, accented with dinner plate sized Dahlias and a profusion of brilliant Stargazer and Asiatic lilies. Loose yourself in a rainbow of colored Hollyhocks and purple and white Foxgloves! Capture the romantic embrace of whispering pines and an evening sunset as the summer fragrances devour your senses with an abundance of seasonal and perennial flowers. As the brilliant blue skied day fades into a canvas of pinks and lavenders, the moon rises and a cascade of stars slowly appear like jewels in the sky. As you swirl around on the dance floor and glance into your new spouse’s eyes, you can’t help but get lost in the canopy of stars above. It truly is a midsummer nights dream. A Gold Mountain Manor Autumn Wedding is a visual delight, embellished with green grass and the changing of the maples, aspens and poplars producing a spectacular bejeweled backdrop of hues. The blazing red and orange maples, shimmering gold aspens and all spectrums of yellow on the poplars are vibrant. Fragrant Red Roses surround the property while the rainbow of tall Hollyhocks frame the mountain garden setting. The Jeffrey Pines exude a warm aroma of Vanilla and Butterscotch and drop plenty of pine cones for you to gather for an accent to your table setting! The days are warm and the nights are crisp. Often times golden leaves are blowing in the wind, spiraling to the ground covering the green lawns. So romantic and makes for great photography!! The skies are usually a brilliant cobalt blue during the day and as your wedding turns from day into night, the skies are studded with stars and the grounds are illuminated with hanging candles and accented with twinkle and swag lights surrounding our Big Bear inn. If you are fortunate enough to schedule on the Harvest Moon in September or the Hunter’s Moon in October, you will be treated to a spectacular full moon, rising right after the sun sets. A Gold Mountain Manor Winter Wedding is for the adventurous and romantic couple. You can be married in freshly fallen snow, which sparkles like jewels all around you or in front of the beautiful red Quartz fireplace garnished with fresh flowers, pine boughs and candles. 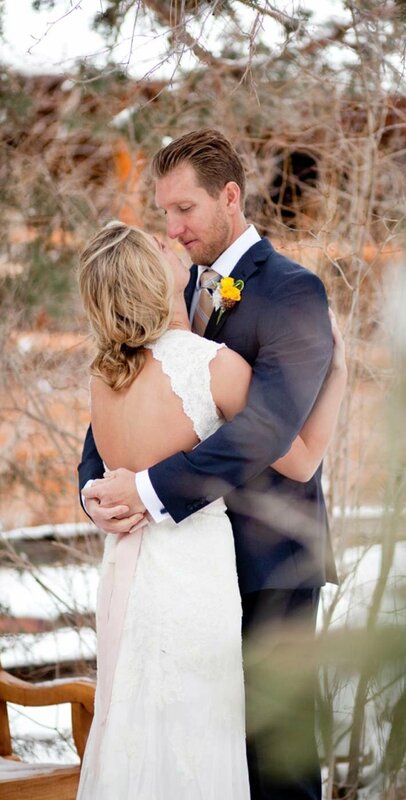 Pack your boots and silk long underwear for your outdoor winter wedding. Be it 2 inches or 5 feet of freshly fallen snow we will shovel or snowshoe a path for you. The natural pine branches of the arch contrasted with the snow creates the illusion of a forested scene from Doctor Zhivago. During your ceremony up to 50 guests will either be standing around you on the snowy lawn or seated on the veranda, which overlooks the wedding site. If you prefer, you can start your entrance by way of the log stairway leading you down into the living room, enhanced by shimmering candles and a crackling fire. 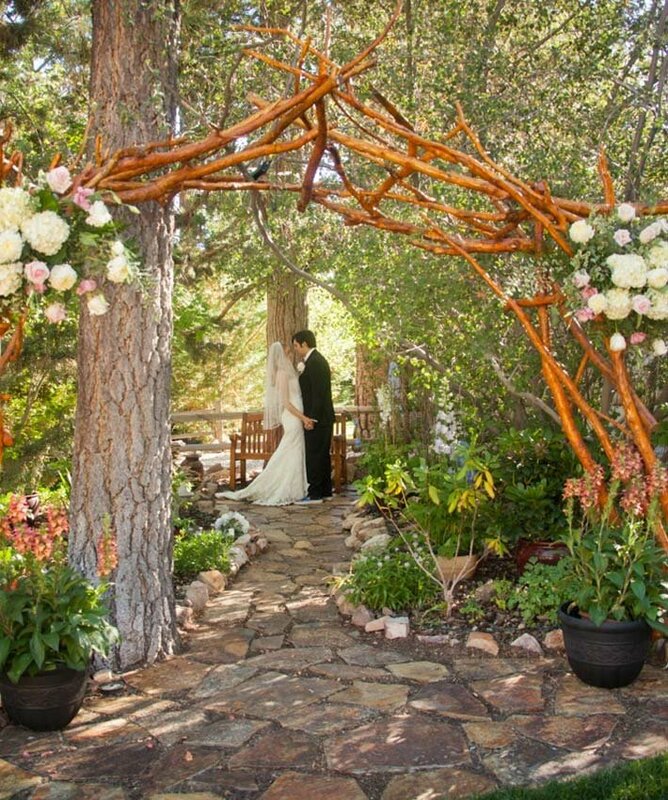 Your ceremony will be in front of the large red Quartz fireplace adorned with flowers, candles and other natural mountain décor creating a very intimate ceremony. The natural log walls and ceiling reflect the light from the candles and fireplace and create a warm romantic ambience. Your reception is indoors and we can accommodate up to 50 guests seated for dinner in our natural rustic and elegant lodge. If you wish to feel like a King and Queen, you may be seated at one long table in the living room, fashioned with candelabras, which can accommodate up to 20 guests. After dinner, in the spirit of Clark Gable (Gone With The Wind) and Carole Lombard, who honeymooned here in 1939, its time to dance the evening away, while outside the snow softly blankets the ground.